Jeff Chase is on a mission to make Las Vegas’ massive convention business green. He’s vice president of sustainability for Freeman, the Dallas-based company that describes itself as the leader in face-to-face marketing. From its Las Vegas facility on West Sunset, Freeman provides tons of materials to trade show exhibitors. And Chase wants to make sure as little of that material as possible ends up in a landfill. That’s a tall task at events like International CES, the consumer electronics event that wrapped up last week at the Convention Center, the Sands Expo Center and Aria. Chase is a veteran at staging trade shows and conventions. He was working for Champion Exposition Co., focusing on green events, when the firm was bought and absorbed by Freeman in 2011. As he became integrated into Freeman’s business, he realized the vast array of “green” opportunities already in place. Chase says sustainability “is not always profitable but cost neutral” is the goal. 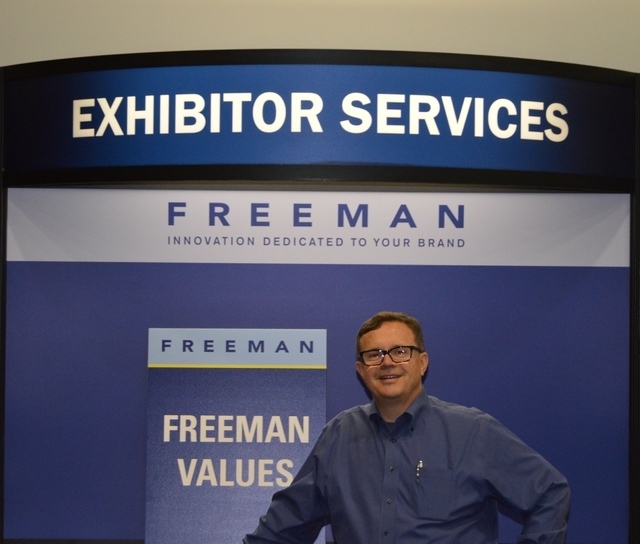 For last year’s CES show, Freeman was able to reach “65 percent diversion rate” for bulk trash, which means only 35 percent of waste was taken to the landfill while 65 percent was recycled. “We’re trying to beat that this year,” Chase says, pointing to a goal of 75 percent diversion of bulk trash. “This is all driven by our clients,” he explains; they requested green efforts and Freeman is working to coordinate efforts with everyone involved. The challenge is “the amount of waste that’s left from a show,” Chase explains. And one of the places targeted for improvement is printed materials. “An awareness campaign” encourages everyone to consider the “pack in, pack out” philosophy. For example, if a show is expecting 3,000 people, exhibitors don’t need to print 3,000 flyers because not every person in attendance will make it to that one booth; they may only need about 1,000 flyers. “Working with exhibitors is a key component,” Chase says. Last year, Freeman “tested the waters” on encouraging recycling and this year a formalized program has all the vendors looking for solutions. Freeman has some allies in the effort. Carpeting and plastic visqueen (a plastic floor covering) are two of the major items that need to be recycled. A Sands employee found a way to recycle the plastic visqueen which is now donated to farmers for use in the fields. The farmers are thrilled to have this material because they usually have to pay for it. Finding new homes for leftover goods is also a solution. Several booths will be donating leftover materials to Habitat for Humanity or Opportunity Village.